Murray Lock has been a cartoonist and illustrator since the early 1970s. In 1979 he established Murray Lock Graphics Limited in Palmerston North, New Zealand, to provide a full range of graphic design services. Lake Superior is a very impressive lake. It is vast and you have to keep reminding yourself that it isn't the ocean. 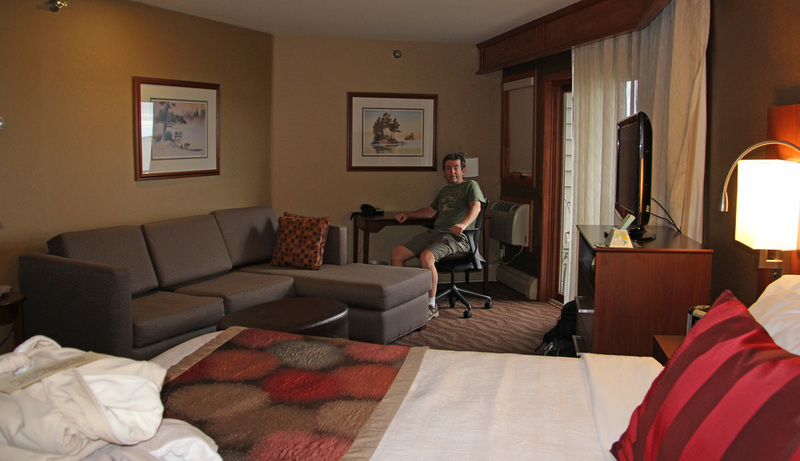 On Tuesday night we stayed at the Best Western motel in Grand Marais, on the shore of the lake. The only room they had left by the time we got there was a large suite that had a jacuzzi, super-king bed and balcony overlooking the lake. They did discount the room rate heavily for us, as everyone knows kiwis don't have any money. I had to work for a couple of hours in the evening and for a short time before breakfast and it was a great environment watching the lake and listening to the gulls circling as I worked. Our view from the balcony. A view from outside the restaurant where we had dinner. This would be a great place to live - if it wasn't for the snow that will be here in a matter of weeks.